Next summer Oakland could lose as many as six to eight of its libraries, though it’s too soon to tell which branches might end up on the chopping block. Funded partly by the city’s general fund and partly by Measure Q—a parcel tax issued in 2004 to expand library services and add a sixth day of service at all library branches—the Oakland Public Library could face a $2.5-3.5 million deficit in July 2015, nearly a 10% drop in its total budget. “Cities that have low-funded libraries are generally on the losing end,” Director of Library Services Gerry Garzón said in a recent interview. Garzón, who served as interim director before his appointment last year, inherited the library crisis from former library director Carmen Martinez in 2012. “We provide services for the entire gamut of our residents, starting from our young patrons all the way to our seniors,” Garzón said. 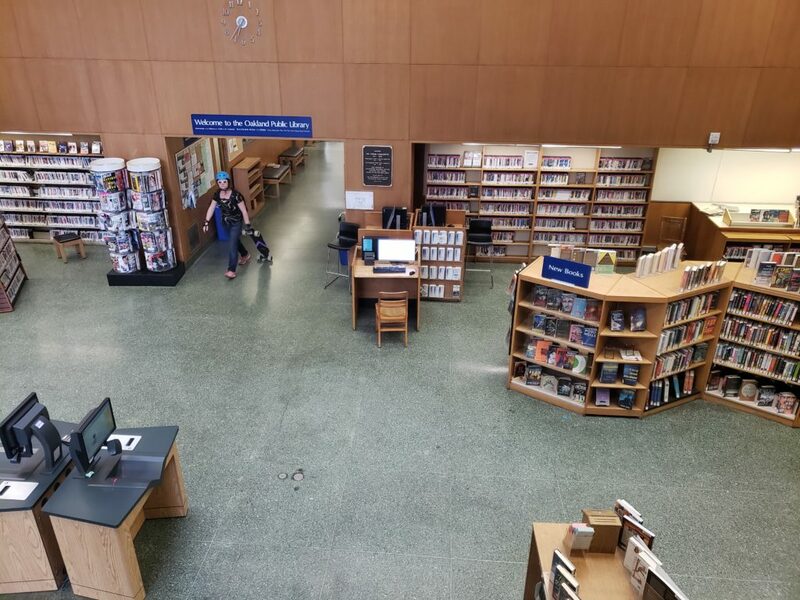 The Oakland Public Library has 16 branches plus the Main Library, the African American Museum and Library at Oakland (AAMLO), and the Tool Lending Library, each of which serve very different communities. Beyond the standard services, most branches offer free tax advice during tax season. The Main Library and the Elmhurst and Martin Luther King Jr. branches have computer tutors. Ten branches offer “Lawyers in the Library,” a free legal advice program that often has lines out the door; all branches have the “Second Start Literacy Program” for adults; and the list goes on. “Each library is unique because it takes care of a unique population,” said Ronile Lahti, a member of Friends of the Oakland Public Library (FOPL). “Rockridge has a lovely meeting room. Golden Gate has their jazz concerts. Each one is serving a specific purpose being in that neighborhood.” The library is also a space for groups from knitting clubs to Neighborhood Crime Prevention Councils to meet. Across the room, employees stacked and shelved, while adult patrons typed away at their computer stations. Sitting at a table in the Teen Zone, a high school student watched intently as her tutor marked up her math lesson. The children’s room, decked out in fall decorations and Halloween books, housed a large shelf lined with colorful children’s art projects. Stephen Newman, library patron and West Oakland native, joined Harris at the DVD shelves to scope out the selection. “The library is really here to educate folks, especially with children, who want to read and want to learn,” Newman said. Closing even one branch, he said, would be a deep loss. “I pray that they don’t, so people can get educated,” Newman said. In the first year of its adoption, Measure Q and the City’s general fund split library funding equally. But since then, Measure Q’s financial support of the library has risen, such that the parcel tax now (FY 2014-15) provides 65 percent of the library’s budget, while the City’s general fund provides 35 percent. Garzón said the recession impacted nearly every city service in addition to the library: Oakland reduced funding to park maintenance, technology, graffiti abatement, Rec Centers, cultural arts programs, street repairs, sidewalk maintenance, tree trimming, illegal dumping response, and more. He said virtually every city service has been affected. The yearly cost of running a small branch library in Oakland is approximately $450,000-$550,000, most of which is personnel costs. Other costs include internal service funds for facilities and utilities, and collections. If branches do close next summer, employees could face layoffs. The first step in bridging the gap came this past June, when the city council voted to set aside a $500,000 “down payment” from the year’s budget surplus for the library’s 2015-2016 deficit. Though that’s a good start, library supporters say, it’s not nearly enough. Earlier this month, seven of the city’s mayoral candidates weighed in on library funding at the Temple Sinai mayoral candidate forum. Rebecca Kaplan said she voted in June to set aside that $500,000 of surplus money. Quan said she put language in the June budget amendment placing the half-million into the library’s Reserve Fund. Courtney Ruby said the library is critical to making Oakland a safer city. Bryan Parker said the library is key in addressing the growing “digital divide” in Oakland. Libby Schaaf, Dan Siegel and Joe Tuman also said they would support fully funding the library as mayor. According to the American Library Association, 62 percent of U.S. libraries report being the only source of free public access to computers and the Internet in their communities. Sterbenc said that though the use of library programs is strong throughout the city, the need for Internet access and childhood literacy support is greater in low-income neighborhoods. 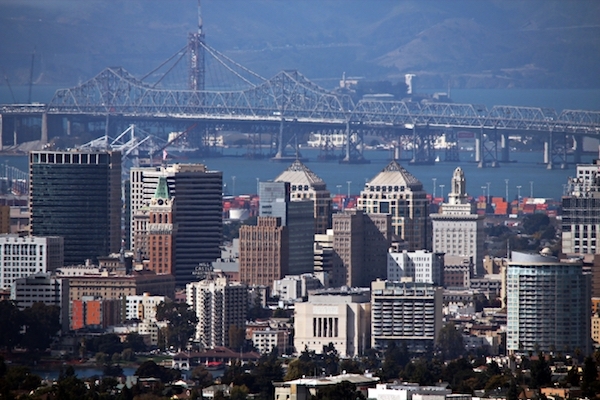 According to figures submitted the California State Library in the 2012-2013 fiscal year, 2.2 million people visited Oakland’s libraries. The total circulation of books reached 2.7 million and of that, 1 million books were placed in the hands of children. That year the library offered 5,200 programs for children, adults and young adults. 163,000 patrons attended these programs. Join us for a zombie march tomorrow night in support of library funding. We all need brains and Oakland Public Library is a place to get more. Save Oakland Library needs YOU to join us on Friday, October 24, from 6 to 7:30 pm and shamble around downtown Oakland, moaning the library’s plight for all to hear. And you should probably wear your rattiest duds and paint yourself up like a zombie so you blend in and they don’t attack you–whether or not to roll in entrails is up to you. SAVE THE LIBRARY! PROTECT THE BRAAAINS! Thanks, Lena, for your comprehensive OPL story. Library’s Reserve Fund. Keep all our libraries open, well-staffed and well-stocked. The author of this story got played in a political tactic. Every once in a while, in anticipation of a new City budget, Oakland’s library activists put out stories saying “OMG WE’RE GONNA HAVE TO CLOSE ALL THE LIBRARIES”. It never happens. There have been cuts and increases, but the great shutdown that’s threatened doesn’t happen. Why? ‘Cause there’s no real threat. The library activists pretend there is as a negotiating ploy to get more funding. And they should get more funding, sure. But at the same time, it’d be nice if they stopped bullshitting the press, and it’d be nice if the press stopped falling for it.